Sárka-Jonae is a novelist, publicist, and journalist, among other “ists” there aren’t room for. Her novel writing career began with Between Boyfriends, an edgy chick-lit book for women who’ve been "Between Boyfriends”, which is much cooler than being single. Sárka-Jonae is a graduate of Syracuse University. Before writing full-time, she was a personal trainer and massage therapist, helping people tone up, slim down, and chill out. In her free time, SJ loves to dance in flash mobs, in music videos, on speakers, or at home in her underwear. She practices kung fu and yoga, was briefly a Buddhist nun, and travels extensively for ”research”. She’s a huge animal lover and has been vegan since 1999. She’s committed to respectfully unveiling the truth about the horrific way factory farms abuse animals. SJ lives in San Diego with two cats and two dogs. As Between Boyfriends starts we find out why Jan is between boyfriends, because hers, Mike, dumps her. If you think that’s the worst thing to befall Jan, you would be wrong. After getting dumped over the phone, she vows never to date again and starts taking up new hobbies on the advice of her best friend. These hobbies, unfortunately, don’t soften the blow because when she informs her parents that she quit college to go to massage school, they unceremoniously cut her off financially and disown her. For the spoiled and high maintenance Jan, this is the equivalent of death and now she must learn to make her own way in life. Sarka-Jonae Miller does a good job of creating a character on the cusp of annoying and unlikable. If Jan weren’t so young it would be easy to hate her as a character. She is selfish, spoiled, and lives in a self-created fantasy world where she is Queen. 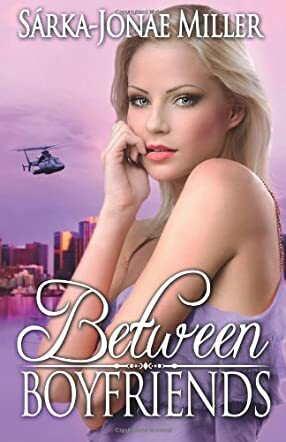 Even after being taken down a peg or two by a few unfortunate events, it takes a while before the Between Boyfriends heroine starts to grow up and make some changes in her life. It’s no wonder her friendships fall apart; the girl can’t even take a healthy dose of the truth from her closest pals. But Sarka-Jonae Miller does redeem Jan and she slowly becomes someone that other people might not just like, but actually want to spend time with. The story was enjoyable but the author spent a lot of time ‘telling’ us what happened than writing the action.